Turbocharged horsepower, why do you want it? Because you can’t get enough of it. That’s me, and I’ve found a pharmaceutical arm patch to keep the shakes down through the summer. Four-stroke technology is not new technology, but is evolving technology within two of the four snowmobile manufacturers. Yamaha leads this with every model within its line using a four-stroke motor. The other leading manufacturer is Arctic Cat, whose ProClimb and ProCross chassis employ two motors; an electronic fuel injected two cylinder two-stroke that is 799cc big. In the mountain segment, this motor powers the M8, M8 Sno Pro and M8 HCR. Cat test rider Todd Tupper lays down some change in some deep Idaho snow. The ProClimb M1100 chassis with a big turbo four-stroke twin can make light work of a heavy day. Next is the 1056cc twin cylinder four-stroke that is in Cat’s M1100, M1100 Sno Pro, Sno Pro Limited (LE), and M1100 HCR (for Hill Climb Racer). This four-stroke, with two large lungs, comes in two variants, turbocharged and non-turbocharged. During our springtime testing we only rode the turbo models. The forward-positioned vertical post gives a mountain rider the steering rotation needed to attack mountains in a wrong foot forward position. Now there are some under skin differences between the two ProClimb models, M8 and M1100 that allow the two motors to fit inside the chassis. But, if the two models were not clearly marked by specific embossing, as to which was which, a person could not readily distinguish the two. Yet, for the trained mountain snowmobiler, the M1100 Sno Pro’s and HCR’s handlebar four-post support tower and lack of a pull rope starter give clues this M is an 1100 and not an 800 of same flavor. And, if you have to ask what track lengths the M1100 comes in, then you’ve truly played your novice hand. There is only one track length for the M1100 and that’s the 162. For your M1100 knowledge, the Standard M1100 does not have the four-post support tower for the handlebars, since the Standard M1100 has a laydown, or over-the-motor, steering post. Its steering is more suited for trail and sit down riding, though some mountain riders prefer this to the vertical steering that the Sno Pro/Sno Pro Limited and HCR have. The four-post tower helps position and support the vertical steering mechanism. It is stout to handle the physical pressures placed on the steering post when pulling the sled into a sidehill, and it aligns bars with the standing driver for proper leverage. While at the original equipment manufacturers’ (OEMs) test ride session in West Yellowstone, twice a day Arctic Cat handed us some variant of the M1100. To keep our turbocharged four-stroke motor skills sharp, Cat also handed us its 1100 crossover breed, the Highcountry, which we will discuss in another feature. We have come to know Cat’s turbocharged Ms and crossovers very well; we know how to prowl the mountains like a mountain cat stalking its prey. The 2.6-inch lugs on Cat’s Power Claw track are the industry’s tallest. This gives the M1100 every excuse it needs to shred mountains. As mentioned, the turbocharged M1100, M1100 Sno Pro and Sno Pro Limited, and HCR come in one track length only — 162; a 153 is not available. The M1100, like the M8, receives Cat’s new Power Claw track with lugs 2.6-inches tall. Cat now has the tallest-lugged track in the industry. With the boosted horsepower the M1100 turbo makes, tall is better. The Suzuki-designed two-cylinder four-stroke has a bore and stroke of 98 x 70 mm for a displacement is 1056 cubic centimeters. A single 46mm throttle body feeds the fuel-injected motor. A dry sump feeds motor oil to vital valve train, crankshaft and piston components. The turbocharger is mated to a stainless steel exhaust. 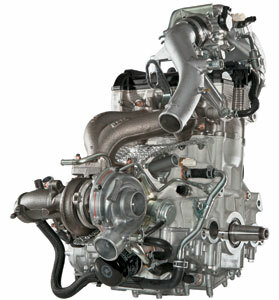 Horsepower for the big twin four-stroke is an estimated 177. Remember, with a turbo, that 177-hp is available at 10,000 feet or 1,000 feet. Nice. All turbo M1100s use a six-post, RPM sensing drive clutch, a 10.75-inch diameter roller cam driven clutch, and a radial master cylinder hydraulic brake where the brake disc resides on the crossover drive shaft. The HCR 1100 is kicked off the planet by Todd Tupper. When boosted horsepower is unleashed, the M1100 defies gravity. Front suspension travel is 9-inches with the rear suspension travel at 16.5-inches. To minimize trail and mogul impact energy to the handlebars, the front shocks are aligned with the front spars, which is the strongest point on the ProClimb chassis. This too reduces chassis flex while delivering a nice ride. The M Standard models come with FOX Zero Pro (IFP) shocks, whereas the Sno Pro and Limited models come equipped with FOX Float 2 shocks. For the HCR, the more race-hardy FOX Float EVOL complements the tall front A-arms. The M1100, all models, have a triangulated A-arm attachment. Like the triangle-geometry on a bridge, this triangulation, gives the chassis’ front-end strength and an approach angle that eliminates, almost in whole, the big mountain sled from diving directly into holes or ruts. Ski-width for all M1100s is an adjustable 38 to 39 inches. Standard features for the M1100 include: front sport bumper, electric start, low-height windshield, deluxe digital/analog gauge, electric gas gauge, low oil pressure light, coolant overheat light, clock, accessory outlet, high/low hand and thumb warmers, heated seat, hand guards, front sport bumper, and ice scratchers. 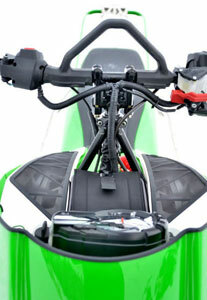 Hand guards and rear tunnel-mounted accessory bag are only available on the Limited. The M1100 retains Cat’s famed telescoping handlebars. — favored by Cat faithful and much respected by other brand loyalists. The turbocharged M1100 is snappy. Even at low RPM, when the motor is off boost, it still has it. However, when boost comes on and the 177 horses take over, the heavy snowmobile with a long tall track becomes a light-footed mountain cat that scurries and scampers like a tom cat chasing a mouse. My time on the M1100 proved these facts. Down the trail it is wicked fast. Best to keep your eyes forward as what you saw a moment ago, is now behind you. When bouncing on mogul tops, the big M is smooth, yet it is its powder characteristics that impress us. 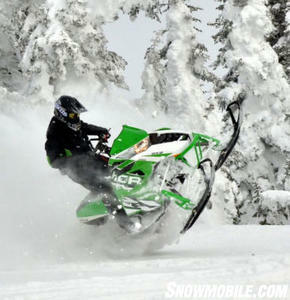 But understand, you must drive this sled different than the M8 Sno Pro of 800cc two-stroke power. There are similarities between the two; however, the 1100’s boost and weight make it a different Cat. Working the throttle to keep the track from blowing out is a learned art. And when closing the throttle, the driver must prepare for a near sudden stop – the engine brakes the vehicle to a stop. Also, boosted four-stroke motors receive throttle input different than a two stroke. Easing into turbo boost is better for deep powder riding than unleashing the sled’s fury as the M1100 will launch out of a turn or ravine, resulting in, maybe, the driver losing his line or overshooting his origin. Overall, the M1100 has a narrow feel. Its seat, runningboards and standup gauges make this snowmobile a mountain sled in every sense of the word. But, it is better suited for big chute blows. Taking the M1100 into the trees to chase an M8 153, for example, will bring on frustration as the sled’s weight and hard-hitting horsepower make navigation somewhat algebraic. Learn this mountain snowmobile. Not only that, the narrow ProCross skis, which is not a powder ski at all, prevent the M1100 from fully floating high on top the powder. Cat’s mountain team needs to correct this by immediately dumping this ski for a wider ski. Enough already. The M1100 is plain vanilla fast. 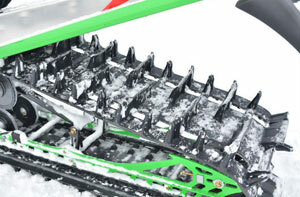 For 2013, the M1100 Sno Pro is hooked up to a 2.6-inch-by-162-inch Power Claw track; it is an incredible climbing track and you will giggle at what you can climb with this waffle stomper. Make no mistake…the turbocharged mill in the M1100 is a monster. Down the trail, the M1100 is a Minnesota lake blaster. But watch out, its sneaky-quiet power will redline your pucker factor; especially when a 45-degree lefty jumps out from the trees in Jason attire. For 2013, the M1100 Sno Pros and HCR come equipped with a vertical steering post, which helps in backcountry and mountain handling. Yet, it is mounted more forward than on the M8. At first, this vertical post threw me off a bit, as if it were a laydown system. Yet with some perseverance and self-patience, I trained my muscles for its unique riding position. Todd Tupper, our factory rider from Cat, schooled us with his master of fine arts in mountain riding, on what he could accomplish on the M1100. He was the professor. Soon we were more at home on the big powerhouse from Arctic. I am unclear on what the future brings when it comes to meeting emission standards. 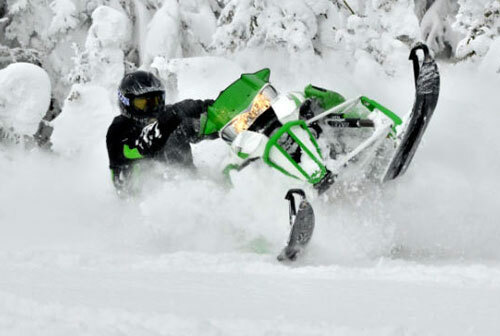 The question that nags me, though, is this: will direct injection technology allow us mountain snowmobilers to keep our choice two stroke motors? I certainly hope so. But one thing for certain, we are seeing a strong four-stroke presence from each manufacturer. In order to survive in the mountains as a consumer-demanded snowmobile, a four-stroke, be it a twin, triple or quad, must be boosted via a turbocharger or supercharger. Yet for any four-stroke mountain sled, there is a catch: weight. Four-stroke mountain sleds are heavy. 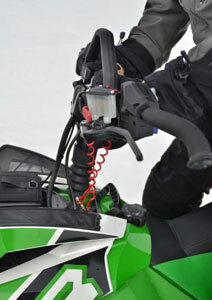 Thus, to haul the weight, to include the rider’s added weight to the sled, turbos or blowers are a necessity. And that necessity adds one weighty-burden, cost. You decide. Ski Stance Adjustable from 38-39-in.